The results achieved by Snam in the year just ended, which are reported in this latest edition of the Sustainability Report, confirm the strength of our company, which, in an environment that continues to be difficult and unstable, has once again been able to combine its strategic mission for the resurgence of our country with the ability to create value for its stakeholders while continuing to manage business activities in a transparent and responsible manner: we believe this is the most tangible and effective way to represent the concept of sustainability. The ongoing economic crisis, unexpected events related to climate conditions, and in particular, the reduction of consumption in the thermoelectric sector have again, this year (the fourth consecutive year) resulted in a reduction of gas consumption in Italy. Over the last four years, demand for gas in our Country has dropped by 25% reaching levels reported at the end of the 1990s, and it will be difficult to reverse this reduction in the short term. In this environment, with domestic gas production declining and a high reliance on foreign imports, Snam has focused on the development of interconnection capacity and the integration of European gas networks. This is an essential strategy to ensure secure procurement and greater liquidity of the gas system in keeping with the long-term strategy recently prepared by the European Union, and this course must be followed if we wish to see the structural alignment of Italian gas prices with those of major European Countries. To achieve these goals, in 2014 Snam invested €1.3 billion in expanding infrastructure in the Italian gas system and developing new services, thereby providing business continuity for the allied industries consisting of a thousand companies nationwide, and over €500 million to acquire 84% of the share capital (89% of economic rights) of Trans Austria Gasleitung GmbH (TAG), the company that owns the Austrian section of the gas pipeline from Russia to Italy that runs through Ukraine, Slovakia and Austria. Following this latest transaction, which continues the trend initiated by the recent acquisitions made along the North-South axis, Snam has enhanced its leadership position among European infrastructure operators, and will now be able to rely on a new key asset in the East-West energy corridor including in the context of a potential reverse flow to Central Europe. Business development has been accompanied by favourable operating and financial results that are in line with the previous year due to the continuing focus on operational and financial efficiency. Gross operating profit (EBITDA) and operating profit (EBIT) totalled €2.8 billion and €2.0 billion respectively, and net profit was €1.2 billion, an increase of 30.6% over 2013. 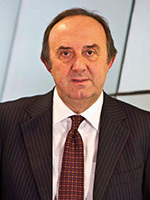 Investor confidence in the sustainability of the business model is confirmed by the 1.9% growth in the stock price compared to the end of the previous year, which was greater than the Italian stock index (FTSE, MIB; +0.2%), and by the international market’s modest reception for the placement of €1.7 billion in bonds. In 2014, Snam stock, which is already a part of the most significant global sustainable business indices, including the Dow Jones Sustainability World Index, FTSE4Good, Climate Disclosure Leadership Index (CDLI) and various ECPI indices and Vigeo, is now part of the United Nations Global Compact 100 index (GC 100) which incorporates the 100 companies at the global level that excel in terms of their focus on both sustainability issues and financial performance. In addition to Snam, there are only four other Italian companies in the GC 100 index. Snam also confirmed its focus on sustainable growth with active support for the Global Compact, its principles and the Millennium Development Goals. We believe that this is the most effective synthesis of recognising Snam’s commitment to enhancing and consolidating the results achieved over time with good governance and the ongoing implementation of social and environmental responsibility practices which are an integral part of the culture and way of doing business. This year’s results include, in the area of work safety, the further decline in accident rates and in the environmental area, a significant improvement in energy efficiency and a reduction in greenhouse gas emissions. Looking to the future of the company, the addition of new human resources continued with the hiring of 185 individuals, more than double the amount of last year, who are primarily young people with college degrees and secondary school diplomas. The materiality analysis launched at the time of the previous Report, and revisited in 2014, served as an opportunity to provide new inspiration for the company’s thoughts on which areas to concentrate its efforts in order to create shared value. Out of necessity, this commitment confirms the importance of discussing issues with all stakeholders as an essential mechanism for providing a contribution to the processes of social transformation under way, while interpreting in an innovative manner the role that Snam has always played in the country’s development. Last but not least, the adoption of the new GRI-G4 standard, which this edition of the Sustainability Report covers in a comprehensive manner for the first time, contributed to Snam’s success in the “Oscar di Bilancio 2014” in the “Listed Companies and Large Businesses” category. For the Group, this recognition confirms the effectiveness and transparency of the reporting system adopted, in which the Sustainability Report has, for some time, served as a comprehensive, supplementary tool along with the Annual Report, Remuneration Report and Corporate Governance Report.